I made a grave miscalculation in the flurry of F2P MMOs I downloaded while looking for some brief weeknight fun to fill the gap left by Mass Effect 2. I was on a breather from Aika, and decided to download Wizard101, which I played for a month or so upon release. I originally stopped playing simply because I had already spent the initial batch of crowns to open up areas to Krokotopia, and was going to have to pay again to continue progressing. I decided to take a break since I didn’t really want to level up an alt and wasn’t ready to buy more crowns at the time. Since I last played (and upgraded my computer twice, losing the installation), Wizard101 has added mounts, crafting, grouping and group chat, and additional areas, so there was really nothing preventing me from re-installing. Well, nothing except for that niggling fear that there is something wrong with me for being a thirty-something without children who enjoys the game so much I lose whole evenings playing it. 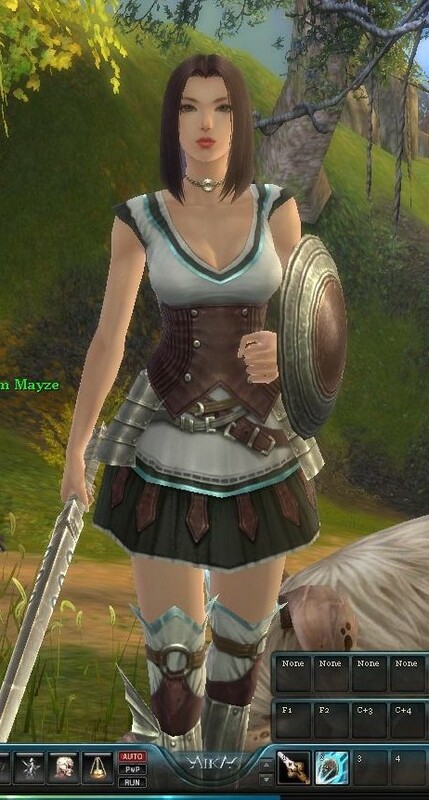 I have been having much more fun than I expected to since my break from the game, leveling my alt character, a Myth wizard in contrast to my Life main. I have also created a Balance wizard that I plan to take through the game at a later date. I have not yet bought the additional crowns for access, but intend to do so, rather than paying the monthly sub. I still hope to get to Lt. Commander and my new ship in STO this weekend, by hook or by crook – it has been more difficult than I anticipated to find even an uninterrupted hour to play in – but this is a different game for a different mood. 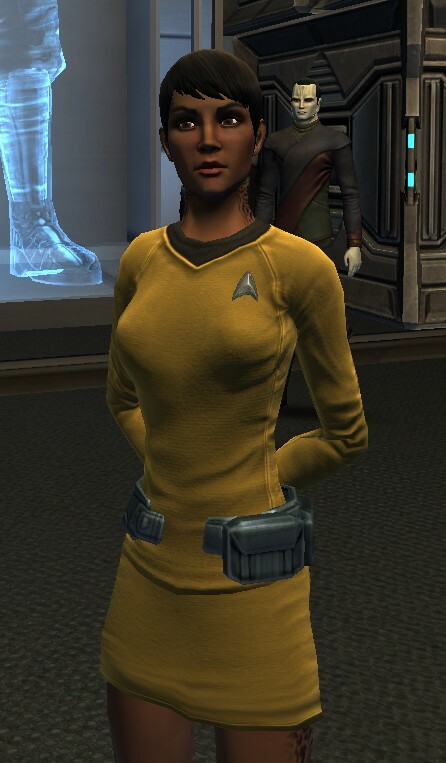 With the Original Series Uniform skirts now available for both captains and their bridge officers, my character’s ensemble is now finally complete! Yardwork calls to me this weekend, so I will not likely be able to rank up from Lt. 9 to Lt. Commander for another week, but progress is being made…. Here are a few things that have gotten me thinking over the past few days while I try to find the time to actually get in game and knock out some story missions (I just met Miral Paris and she was positively divine). Van Hemlock’s Podcast #88, in which John and Tim discuss various Star Trek episodes and establish that what fans usually choose as their favorite episodes would generally make for awful MMO gameplay. This is something I have given some thought previously, but the podcast really drove it home for me. Because we might consider this to be a failing of MMOs in general, I would not be so hasty as to assign blame to STO in particular. In some ways, I would like the option to be able to banter with a Q-like character the way Picard would, but I would like the option to do so as myself, more – and how would a game go about rendering that without a million dialogue options for a million personality types? At best, it could provide me with a Picard-like dialogue option… or a Sisko-like punch to the jaw. What of Janeway? How would Kirk respond to Q? Perhaps in this hypothetical Star Trek Online we can be presented with the option when we create our Captains: what “type” of Captain personality would you rather emulate? No, I think of some of these creative freedoms as more pipe-dreams than reasonably possible. The presence of two or three options in a mission like some of those from the episodes in the Van Hemlock podcast would just serve to illustrate the restrictions I’m faced with; that I can do A or B, but not C would break my immersion even more than the absence of choice entirely. This is also my view of the upcoming SW:TOR, by the way: while I have no idea how it will ultimately play out, I am concerned that the vaunted storyline-changing choices we will be presented with will only feel illusory to me. Somewhat related to the subject of Star Trek or Star Wars fans who seem to want very strongly to play a virtual world simulator, I have always wondered how large this market really is. They certainly are vocal, judging from forum posts and the still-raw responses to the Game-Changing-Patch-That-Shall-Not-Be-Named; certainly Star Wars Galaxies’ sub numbers took a dive after that debacle. And even more certainly, I was not there when it happened and know very little about how the game was or how it was changed beyond my brief stay in the free trial one uneventful weekend. But this article linked by Scott Jennings in his column about MMO Failures speaks with several fans who note they had multiple SWG accounts each – one even claims to have had ten accounts. Perhaps these were outliers, but it makes me wonder how many single subscribers there were for SWG among that oft-quoted 200,000 number. Still, if you were paying $150.00 per month to play a game, I can understand more now why you would still be angrily posting about it five years later. Finally, Fidgit interviews Craig Zinkievich and CZ confirms that Cryptic was given under two years to complete STO. Obviously this is Atari’s MO, for better or worse, and frankly, if I have any beefs with it I leave them at Atari’s feet, not Cryptic’s. This is especially true because given those two years, I think Cryptic has turned out something pretty incredible; in the same timeframe or longer, Perpetual had merely delivered mocked-up screenshots, and yes, I am still annoyed with them for having killed Gods & Heroes in the meantime. I don’t have any comments in particular on whatever recent thing Cryptic has said or done that has people annoyed, because I just don’t have it in me to be angry with a company that has made a game I enjoy playing as much as I enjoy STO. I find myself thinking about the storyline, about my Captain’s skills and my ship’s gear, about whom I wish to recruit as Bridge Officers and who gets to man the ship and who gets to come along with me on away missions, and honestly a game hasn’t captured my attention like this since Guild Wars, or maybe the first 10 or so levels of LOTRO. Considering my default position is that all companies are generally greedy and evil and not at all altruistic – the bigger the company, the greedier and eviller – I simply don’t find Cryptic to be more greedy or evil than any other. I am, however, pretty annoyed with Atari for taking its stance, as I am not sure how well it can end for any of the parties involved. Unless and/or until Cryptic hones their engine into a lean, mean, MMO-creating machine, I see Atari continuing to generate ill-will in the industry. I just hope that in time people start focusing their ire on the man behind the curtain. STO on a Mac? STO on a Mac! Thanks to this enterprising fan, I am now happily playing Star Trek Online in Mac OS X instead of using Bootcamp on my iMac. I had been having problems with dropping frame rates with my Windows install for no particular reason, forcing me to stop playing once I found myself in a space battle with 2-3 frames per second on the lowest graphics setting possible. With very little setup involved, I was up and playing fluidly with recommended graphics settings in Mac OS using the app linked above! What I find especially interesting is that this is a labor of love by a fan; usually Mac users have to wait until a company like CrossOver Mac have finagled a way to get the game working in a Mac environment, and this guy is doing it for free, and providing support on the forums as well, responding to comments and suggestions. I simply couldn’t pass up the chance to give him kudos, so: kudos, @doh123!